#266) Curb Carbon or Fission Fast? Pro-nuker Rod Adams correctly pointed out that I know nuttin’ when it comes to the issue of nuclear power today, but more importantly, he offered up a simple slogan (Fission Fast!) just as I was thinking of a similar simple slogan (Curb Carbon), neither of which are much use in a world so fractious and leaderless that nobody’s listening to any leaders. Oh, well. NUKE THIS! From an anti-nuclear rally last year in Tokyo, more than 30 years after the No Nukes rallies in the U.S., showing the staying power of a good slogan. I’m kinda opinion-free when it comes to nuclear power, having not delved into the topic deeply enough to have strong thoughts on either side. I know the potential risks are nightmarish, but the fears have often been over-blown. Such is the power of fear-based communication. In my book, I mentioned my German editor, whose father is a nuclear engineer, who simply can’t understand why the facts failed to win out in Germany when it comes to nuclear power. But I’ll tell you why. The climate movement is so massively cerebrally driven (thus my complaint a while back about what I termed, “The Nerd Loop”). They are so proud of their endless, endless studies of polling data and framing and message boxing and semantics and semiotics and … yet … in the end, they can’t communicate their way out of a box. And thus they allowed their entire message and movement to be co-opted by a group of Hollywood producers who shoved out on the world stage a nice guy who had lost his Presidential bid and taken to giving humble Powerpoint talks. All of which drove the entire movement into the ditch in which it now sits, smoldering, directionless and leaderless. I don’t know how you fix this. Maybe you hold separate rallies within the movement that say, “Stop Being So Cerebral!” It’s the source of the problem. Heavily cerebral types have a hard time unifying. Lynch mobs tend to not be very deep thinkers. Not that you want a lynch mob. I’m just talking about the core dilemma. I think (there I go, being cerebral myself) it’s the undoing of the climate movement. Too much thought. Too analytical. Too many people parsing every thought and suggested slogan. Oh, don’t be such a scientist. Good luck unifying so many independent thinkers in an age of corporate culture. How’s that for a pretty grim assessment? As I get ready to spend tomorrow serving on a committee with the American Institute of Physics which should be a fascinating look into yet another culture that I have no experience with. Yeeha! In 1979 I attended a No Nukes rally in D.C. that was 170,000 people. A couple days later the NYC rally was over 200,000. That’s your “baseline” for mass rallies. Climate is supposed to be the biggest threat ever, but the rallies are an order of magnitude smaller (and “An Inconvenient Truth” never produced any significant rallies). Here’s four hypotheses to account for the difference. “EVERYBODY NEEDS SOME POWER I’M TOLD”. I was among the 170,000 on the Captial Mall in D.C. singing along with with John Hall in 1979. Why aren’t the climate crowds as big? I guess that’s the sort of memory that still burns in my mind when I look at today’s limpid, sold out, fractious, climate movement. What happened? Why were the mass rallies so massive back then, but today are so minimal (while the budgets of the NGO’s are so massive)? I felt and expressed this after the Gulf oil spill in 2010, and even went up to Santa Barbara to interview some of the people who were around in 1969 when the Santa Barbara oil spill produced a huge public backlash against the oil companies. There was nothing of the sort for the BP spill. Why do mass rallies still matter? Because despite the internet, we are still a television-oriented society. Television shapes our perception of the real world, and “perception is reality.” Images of online petitions of 100,000 people offer no authority and are easily faked. Images of 100,000 live bodies assembled for a rally says EVERYTHING. So here’s four hypotheses to account for today’s minimalist climate rallies compared to the days of No Nukes. Malcolm Gladwell maybe jumped the gun a little bit in 2010 with his New Yorker article, “The Revolution Will Not Be Tweeted,” which, similar to just about all of his stuff was pretty flippin’ brilliant. The following spring, the arab nations used social media as a central element for their upheavals, suggesting their revolution actually was tweeted. Then it’s not clear, particularly with Egypt, how solid the revolution was in the end. Who knows. But there’s no denying more Americans are sitting in front of their computers these days thinking they are changing the world with their keyboards (um … like maybe me?) instead of getting out in the streets. Most of them would probably argue their actions on a keyboard are just as effective as turning up in person for rallies. Gladwell wouldn’t agree. I wouldn’t either. Seeing is still believing in this country. No social media excuses are valid. Andy Revkin, in 2006 in one of the best essays of his career titled, “Yelling “Fire” on a Crowded Planet,” cited Helen Ingram of U.C. Irvine who said that problems which receive attention tend to be, “Soon, Salient, and Certain” (btw, I attended his Zocalo event last week here in L.A. which was great and he mentioned this element). Revkin talks about how pushing for a sense of urgency for a threat which isn’t “soon” could actually be counter-productive as people burn out. Which is interesting because in November, 2008, Al Gore was quoted in the NY Times talking about the failure of the climate movement saying, “There is not anything anywhere close to an appropriate sense of urgency.” Meaning he and others paid no heed to this element of “soon” with regard to the threat. In contrast, the nuclear power danger became enormously SALIENT in the United States on March 28, 1979 with the Three Mile Island accident, which never killed anyone but was terrifying enough to launch the mass protests. There are some environmental pundits who believe global warming/carbon emissions will never be a powerful enough force in the U.S. to launch mass demonstrations until we get a summer heat wave producing huge numbers of death as happened in France in 2003 producing over 14,000 heat-related deaths. 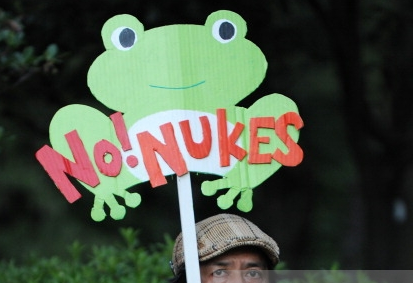 Look at what the No Nukes rallies had in narrative terms. The writers of “The Simpsons” knew this and put it to use with the Springfield Nuclear Power Plant owned by Montgomery Burns. EVIL – They had a singular source of very visible evil — the nuclear power plants. One of the key principles in storytelling is that, “your story is only as good as your villain is evil.” The nuclear industry is an awesome and perfect villain, filled with mystery tracking all the way back to the atomic bomb era. ALONE – It was indeed a different time for society in 1979, on the eve of cable television, but still just 3 or 4 channels in most homes. Today’s world of a go-zillion channels of everything is more factitious than ever, but Obama has proven that leadership still works if you have a voice that is trusted and liked. Just look at the budgets of today’s environmental NGO’s. I guess it’s something nobody likes to talk about. And yes, I know, you need all the lawyers, scientists and economists to fight big business. But it ain’t the same impassioned movement as the old days. It was more grassroots back then, less DC-based NGO’s. The pyramid has become inverted. Less grassroots today, more big NGO’s with big budgets (without naming any names, the biggest one had income of over $1 billion in 2011 — wow). So that’s what’s changed. Which I suppose is inevitable. But the picture is clear. 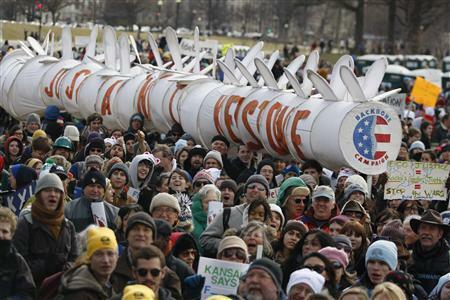 The environmental movement got richer, smarter and more bureaucratic, but the rallies today are smaller than back then. I think that’s kinda sad. 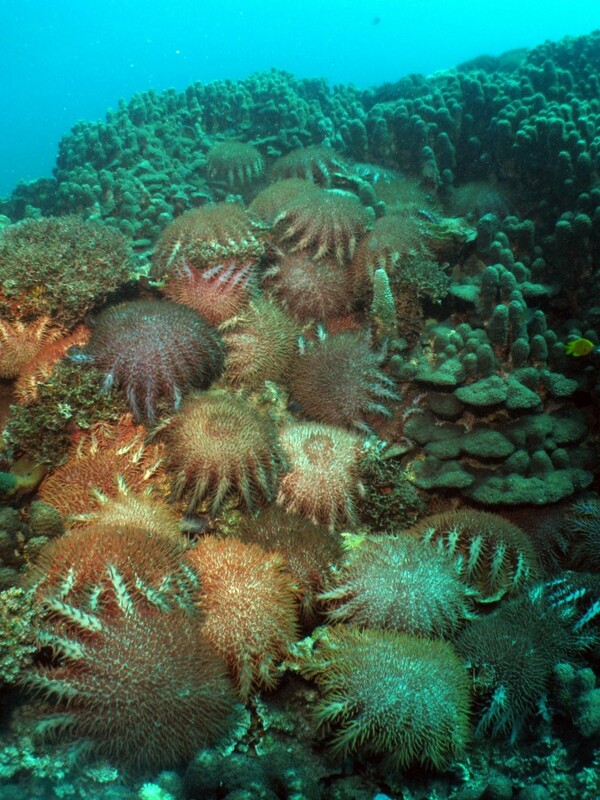 That’s the inescapable conclusion when you look at the 50 years of research on the crown-of-thorns starfish problem that has led to no clear answers. This includes my own work in the 1980’s. HAVING THEIR WAY WITH NATURE AND SCIENCE. The starfish must find it hilarious that after 50 years of research nobody still knows how or why they come and go so dramatically. Sorry. I suppose I should put it a little more delicately. But seriously. FIFTY years of research, tens of millions of dollars spent, and we can’t tell you why an extremely common starfish undergoes population explosions? It is a monument to the impotence of the entire field of marine biology. Terrestrial ecologists have no trouble telling you what causes locust or bamboo cycles. But crown-of-thorns starfish? It was a mess when I studied it in the mid-80’s, it’s still a mess. Not that there aren’t lots of great marine biologists in this world. I’ve known heaps of them. But let’s be honest, this is one of the biggest questions in the entire field of marine biology, and it’s not a particularly complex question (“Why the population explosions?”). And yet … here’s an article just this week saying pretty much nobody knows nuttin’. The article does claim the folks on the Great Barrier Reef have got their story worked out (that the population explosions are caused by nutrient runoff from the land feeding the larvae — if only larval ecology were that simple). I don’t have the time and energy to try and still promote the 4 years of work I did on the problem in the mid-1980’s studying the larvae of the starfish and publishing several peer-reviewed papers. But I will say this — their current thinking (mentioned in this article) is simply wrong. And every so often a marine biologist will track me down with this opinion that they are all wrong and I will agree. But it’s a rats nest, with funding motivation at the core of at least some of the opinions. Again, sorry, too busy to wade into it. Life is too short. I have movies to make. But this is pathetic that 50 years has produced so little knowledge.